You know how I am about "National Days". I consistently post about them. Well, folks, today is National Watermelon Day! I love the sweet, juicy flavor of watermelon and eat it often, especially in the summertime. If you want a watermelon fix, might I suggest Applebee's. 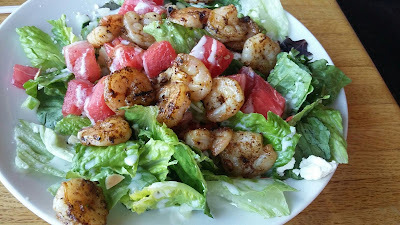 One of their new menu offerings is the Grilled Watermelon and Spicy Shrimp Salad. It's not a flavor pairing that I'd ever imagine going well together, but I was pleasantly surprised to find it balances out well. 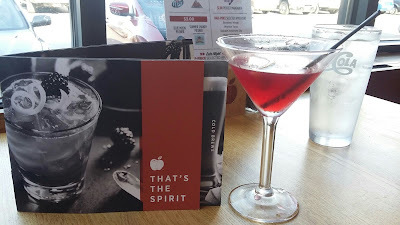 My husband and I recently spent an evening at our local Applebee's, and we gorged on all sorts of great food. We both shared and delved in to the Grilled Watermelon and Spicy Shrimp Salad. The sweetness of the watermelon with the spiciness of the shrimp made it an amazing dish. Jason and I also tried the new Crispy Chicken ‘N Spicy Cornbread Salad. I didn't get a picture of our dish because Jason tore into it, and the salad disappeared quicker than a toupee in a hurricane. (Apparently he hasn't learned up on blogger rules!) Anyhow, this salad was just as yummy and filling as the first one. ·Crispy Chicken ‘N Spicy Cornbread Salad: Mixed greens, made-in-house jalapeno cornbread croutons, grape tomatoes, shredded cheddar, applewood-smoked bacon and buttermilk dressing. · Southwestern Steak Salad: Hand-Cut Wood Fired USDA Choice Top Sirloin Steak paired with chimichurri, pico de gallo, corn and black bean salsa, cheddar, crispy tortilla strips and a creamy house-made cilantro ranch dressing. ·Grilled Watermelon and Spicy Shrimp Salad: Mixed greens, cucumbers, feta, almonds and house-made creamy mint-Greek yogurt dressing. Also available with Spicy Blackened Chicken. ·Spicy Blackened Grilled Chicken, Avocado and Grapefruit Salad: Mixed greens, pickled in-house red onions, cilantro leaves and house-made champagne vinaigrette. Because that's how we roll, Jason and I went all out and ordered other food beyond the salads. 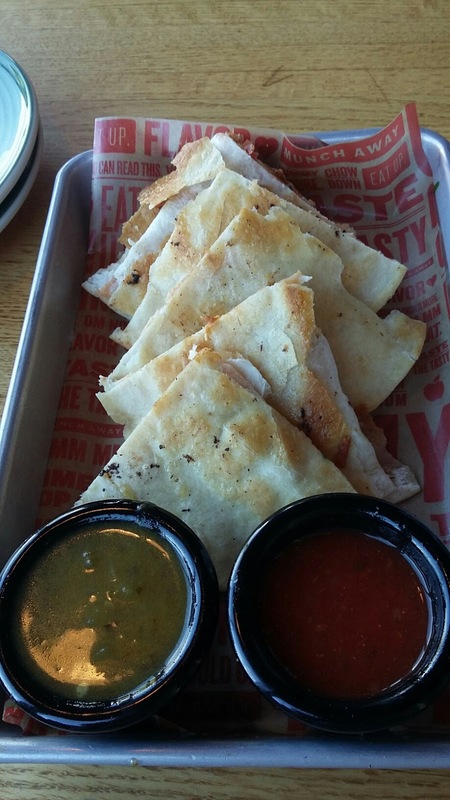 We had an appetizer of Chicken Quesadilla and I had a fancy foo-foo margarita. Jason and I finished off our meal with the Triple Hog Dare Ya sandwich, piled with ham, pork, bacon, crispy onions, and sauce. And it came with an order of fries. Jason and I committed fabulous gluttony. 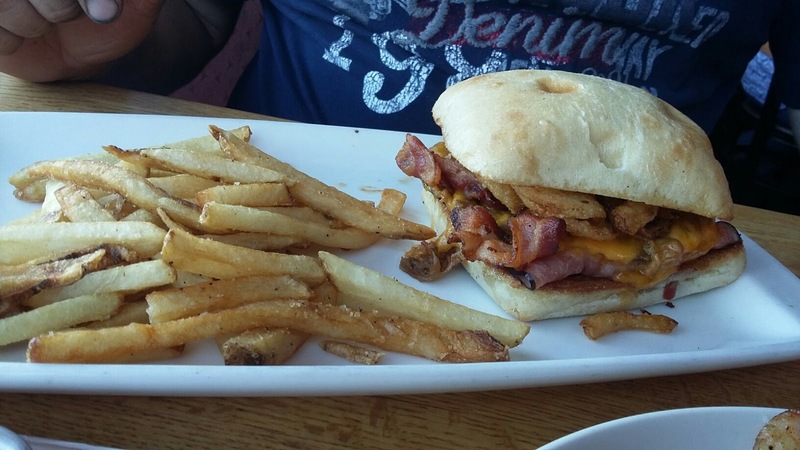 Everything we ate at Applebee's was appetizing, and the service was prompt. The new grilled seasonal salads are a great addition to the already mouthwatering menu options. One person will win a $50 Applebee's gift card. I think I would like to try the NEW Crispy Chicken ’N Cornbread Salad. My first choice would be the Southwestern Steak salad! Sounds yummy! All of these sound delicious! I would start with the Crispy Chicken ’N Cornbread Salad. I would like to try the NEW Grilled Chicken, Avocado and Grapefruit Salad. I'd like to try the Crispy Chicken 'N cornbread salad. I would love to try the southwestern steak salad! I would love to try the Crispy Chicken ’N Cornbread Salad. I would most like to try the Southwestern Steak Salad. The southwestern steak salad sounds delicious!! I would like to try the grilled watermelon and spicy chicken salad. I would choose the Grilled Chicken, Avocado and Grapefruit Salad. I want to try the NEW Southwestern Steak Salad! I want to try the NEW Southwestern Steak Salad!! I would try the NEW Crispy Chicken ’N Cornbread Salad. The Grilled Watermelon and Spicy Shrimp Salad sounds good. I would love to try the Southwest steak salad. I would love to try the grilled watermelon spicy chicken salad. Very unusual combor but sounds so good. I'm torn! I'd love to ty the Grilled Watermelon and Spicy Chicken Salad as well as the Southwestern Steak Salad! They both sound fabulous! First I would try the Southwestern Steak Salad. I'd love to try the Grilled Chicken, Avocado and Grapefruit Salad. I would like to try Grilled Watermelon and Spicy Chicken Salad. I would get the Southwestern Steak salad. I would try the Southwestern Steak salad. I would order the NEW Grilled Watermelon and Spicy Chicken Salad at Applebee's. The Southwest Steak Salad is definitely what I would try first. I would love to try the the southwestern steak salad. These look great! The Grilled Chicken, Avocado and Grapefruit Salad for sure! The Southwestern Steak Salad sounds delicious. The Grilled Watermelon and Spicy Salad. I would love to try the Grilled Chicken, Avocado and Grapefruit Salad cause I love fruit in my salad! Grilled Watermelon and Spicy Chicken Salad sounds good! The Grilled Watermelon and Spicy Chicken Salad is what I would most like to try. Thanks. the Grilled Chicken, Avocado and Grapefruit Salad sounds great, and there's a shrimp option, which also sounds great. I hope I win this gift card so I can try it both ways! Crispy Chicken ’N Cornbread Salad, thank you. I would like the Grilled Chicken, Avocado and Grapefruit Salad. I'd like to try the Southwestern Steak Salad. The Southwestern Steak salad sounds tasty. I would like to try the Grilled Chicken, Avocado and Grapefruit Salad. The watermelon and shrimp salad sounds so intriguing. I'd love to try it next time I'm there. I'd try the NEW Grilled Chicken, Avocado and Grapefruit Salad. It sounds so refreshingly delicious! I want to try the Grilled Watermelon and Spicy Blackened Chicken badly. The Southwestern Steak Salad would be my pick for sure! Would love to try their Southwestern Steak Salad! I really want to try the southwestern steak salad! yum! The Southwest Steak Salad sounds awesome! 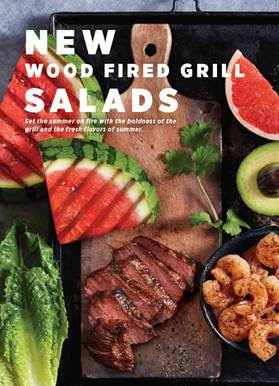 I would like to try the Grilled Watermelon and Spicy Chicken Wood Fired Salad. Watermelon and grilled chicken a perfect summer pairing. I would like to try their Southwestern Steak Salad. Grilled Watermelon and Spicy Chicken Salad. I want to have the crispy chicken n cornbread salad with ranch dressing. I would like to try the NEW Crispy Chicken ’N Cornbread Salad most of all! Thanks for an AWESOME giveaway! I would love to have the Southwestern Steak Salad. I would pick the Southwestern Steak salad...looks amazing! Gotta be the Southwestern Steak salad. The southwestern steak salad looks good! They all look great so I would start with Southwestern Steak Salad.! I'd try the The Grilled Watermelon and Spicy Shrimp Salad! I would like to try the Crispy Chicken ‘N Spicy Cornbread Salad. Grilled Watermelon and Spicy Chicken Salad is what I want to try out. Would love to try the Southwestern Steak Salad. I would like to try the NEW Crispy Chicken ’N Cornbread Salad. Id try the Southwestern Steak Salad...actually that sounds good right now! I would love to try the chicken and cornbread salad. It reminds me of my southern grandparents and the meals they used to make. They all good, but I'll choose the Southwestern Steak Salad. I would love to try the Grilled Watermelon and Grilled Shrimp Salad! I would really like to try the Southwest Steak Salad. Yum. Id love to try out the crispy chicken and cornbread. I most want to try the Grilled Watermelon and Spicy Chicken Salad. I want to try the Crispy Chicken ‘N Spicy Cornbread Salad. I'd like to try the new southwestern steak salad. I'd like to try the Grilled Watermelon and Spicy Chicken Salad!! Im a southern girl so the Crispy Chicken ’N Cornbread Salad caught my eye right away! The Southwestern Steak Salad looks soo good! Grilled Watermelon and Spicy Chicken Salad sounds great! They all look great, my first choice is the Grilled Watermelon and Spicy Chicken Salad. I have seen the ad on tv for these and I can't wait to try the Southwestern Steak salad. I am not a salad gal, but if you put crispy chicken & cornbread in it-I'll give it a try. (Emily Ann on rafflecopter) I'd love to try the grilled watermelon & spicy chicken salad! It sounds so good and watermelon + chicken are my favorite foods! Applebees definitely did it right! I would like to try the Crispy Chicken ’N Cornbread Salad. I would love to try the Crispy Chicken 'N Cornbread Salad. The Crispy Chicken ’N Cornbread Salad looks and sounds delicious! I would love to try that! The Southwestern Steak Salad looks delicious! I would choose Southwestern Steak. The healthy thinker says Grilled Watermelon and Spicy Chicken, but the Chicken and Cornbread sounds delish. I would love to try the southwestern steak salad because it sounds so good. I would like to try Applebee's new Southwestern Steak Salad. I think it looks delicious. I even like the one with avocado. I would like the Crispy Chicken & Cornbread salad. I'm on a big salad kick lately so I'd love to try the Southwestern Steak Salad but in truth they all sound downright delicious! Crispy Chicken ‘N Spicy Cornbread Salad sounds good! I love steak so I would order the Southwest Steak salad. They all sound really good! The chicken and cornbread salad sounds delish! I would love to try the Southwestern Steak Salad, sounds so delicious! Southwestern Steak Salad sounds so good and the cilantro dressing - YUM! I would most like to try the Grilled Watermelon and Spicy Chicken Salad. I think the Southwestern Steak Salad sounds great so I'd choose that. I would love to try the Southwestern Steak salad. I'm a southern girl so the Crispy Chicken ’N Cornbread Salad sounds delicious! I'd love to try the Southwestern Steak Salad! I would love to try the Grilled Chicken, Avocado and Grapefruit Salad. I think it looks wonderful and delicious! I would most like to try the Grilled Watermelon and Spicy Shrimp Salad!